Matching is great fun for 5 year olds and this set provides several ways to do the matching. 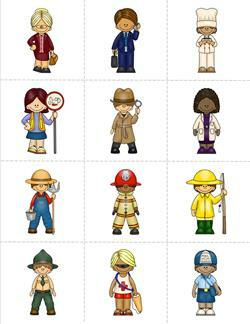 To match the images of the community helpers matching game, print two sets of the images. You can use the whole set of 24, or just some of them. The same for the word cards, print two sets and match. Or you can match the image cards to the word cards. The pictures will be easier for younger kids. 4 pages, 2 of images and 2 of job titles. 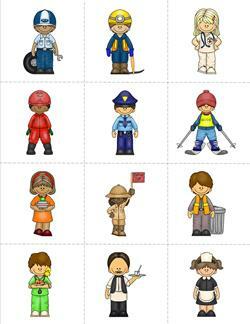 This first page of matching game pieces has images of 12 community helpers. Print and cut apart on the lines. Matches with the job titles on page 3. Here's page 2 with 12 more images of helpers in the community. Print and cut along the lines. Matches with the job titles on page 4. This page has a list of job titles that matches with the images on page 1. Print, then cut along the lines. 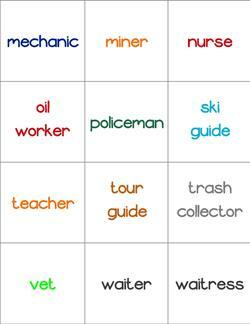 Hint: The colors of the words match the helpers. This page of community workers has 12 job titles cards. These match the images of the helpers on page 2. 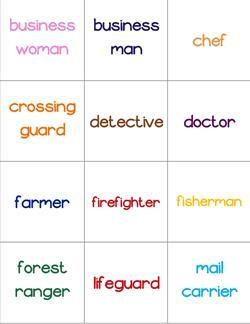 Hint: The colors of the words match the helpers.